Arthur Sullivan, who revitalised British music in Queen Victoria’s reign, was born in Lambeth. His parents, Thomas and Maria, spent their honeymoon in 1838 as the first tenants of No 8 in the newly built Bolwell Terrace. Thomas earned a guinea a week for clarinet playing and paid an annual rent of £22. 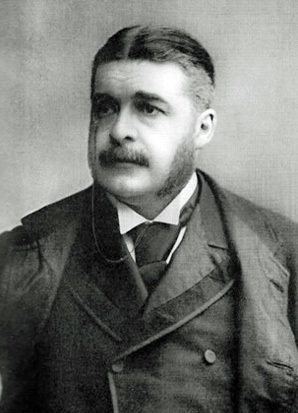 The first of his two children, Frederic, was born in 1839, and on 13 May 1842 Arthur Sullivan was born. He was christened in St Mary-at-Lambeth and the organ of this church was probably the first he ever played. Bolwell Terrace (later renamed Bolwell Street) was a turning off Lambeth Walk. Part of it was demolished about 1951 and the remainder finally disappeared in the redevelopment of Lambeth Walk in the early 1970s. Until its demolition Sullivan’s house was identifiable by a plaque put up by the Incorporated Society of Musicians. Thanks to Spike Milligan, the front door of 8 Bolwell Terrace is preserved in the Museum of London, but the whereabouts of the plaque is unknown. However, Sullivan’s early connexion with the neighbourhood was revived when Monkton Street SE11 was divided by the building of a new children’s home; the eastern end of the street was renamed Sullivan Road (Gilbert Road is on the opposite side of the Lambeth Hospital site). In 1845 Sullivan’s father became Bandmaster at Sandhurst Military College, and here Arthur learnt all the instruments he could find. Aged 11, he became a Chapel Royal chorister and lived with his nine fellow choristers at 6 Cheyne Walk, Chelsea. Aged 14, he won the new Mendelssohn scholarship which sent him to the Royal Academy of Music, and later to Leipzig, aged 16. His father’s sacrifices enabled him to study for two and a half years in Leipzig, where he was popular but despite being feted, lived a frugal existence. But it was exciting too. Grieg was a fellow-student; he met Liszt; fell in love with both Clara Barnett and her sister Rosamund; and in August 1860 saw the fiercest storm ever experienced in Germany. Sullivan set to work on his Shakespearean “Tempest” music. He returned to London in 1861, spent a year in respectable obscurity at 3 Ponsonby Street, Pimlico Square, until August Manns played his “Tempest” music at the Crystal Palace. Sullivan woke up next morning famous. England had produced a composer to be reckoned with. Sullivan wrote a symphony, cello concerto, oratorio, songs, anthems etc, which established him as the greatest British-born composer since Purcell. It was not until ten years later that the legendary collaboration with W. S. Gilbert began. The success of the “Savoy” operas brought him even greater fame and wealth. He was sought by Royalty and Society. But the elitists were pressurising him to write “masterpieces” to uplift British music. He undertook too many commitments, and suffered lifelong pain from kidney disease. He would usually compose only throughout the night when he could be undisturbed. He was knighted in 1883. Gilbert and Sullivan are ever popular but the rest of Sullivan’s music has suffered as a result and has largely been ignored. The 1978 Lambeth Summer Festival included a concert of exclusively Sullivan music, at which Joseph Pilbery, the founder of the Sir Arthur Sullivan Society, conducted the first professional performance this century of a Sullivan ‘Te Deum’, and other rarely heard Sullivan music. Sullivan died in 1900 and was buried in St Paul’s cathedral by command of Queen Victoria who was to survive him by only a few months, but who had already reigned for five years at the time of Sullivan’s birth. The Sir Arthur Sullivan Society exists to publicise the music of Arthur Sullivan and other neglected British Victorian composers. On Tuesday 8th March Albert Truelove, formerly secretary of the D’Oyly Carte Company, talked to the Society about the famous partnership which was the origin of the company’s success. W.S. Gilbert and Sir Arthur Sullivan first met in 1869 and their first collaboration was in 1871 when they wrote ‘Thespis’ which was not particularly successful. In 1875 Richard D’Oyly Carte wanted a one-act opera as a curtain- raiser and he persuaded Gilbert and Sullivan to write it. They produced ‘Trial by Jury’ which was an immediate success and thus the great partnership really started. During the following twenty years twelve more operas appeared with scarcely a break between them, several running for over five hundred performances. More recently the company has toured up to ten operas to the provincial theatres for thirty-five weeks, returning to London for the thirteen week pantomime season. Careful planning of the itinerary was needed to keep travelling expenses to a minimum. In the early 1950s the company travelled by train with reserved carriages for the cast and trucks supplied free by the railway for scenery and costumes, but gradually these facilities were cut back. Also the actors’ union, Equity, insisted on fewer sessions so that rehearsals were reduced from five to two per week. A myth persists that the operas were always performed as originally directed by Gilbert but this is a fallacy, and many famous designers and directors were involved over the years. True, the costumes for ‘The Mikado’ were kept to the same designs for many years, but new ones were continually made to the original designs, whilst the scenery changed many times. The order of performances involved complicated scheduling to ensure the availability of the principals. In London it was customary for an opera to be played for a whole week or half week, the whole week running from Thursday to Wednesday so that visitors to London might see two different operas in the week.